Have you ever dread about losing your important data? Well, we are sure almost every user must have gone through this predicament. There must be instances when you have lost or deleted an important file accidentally from your computer. In such times, the best fix is to seek help from the data recovery software. You may lose important files because of a virus infection, a hardware failure or simply a human error. When the hardware fails or a file gets deleted by accident, this is the golden chance to get help from a data recovery software in order to get your data back before it’s gone for good. Surely, there are tons of best data recovery tools and software available on the internet but we will recommend you only those that offer the most value and great service. 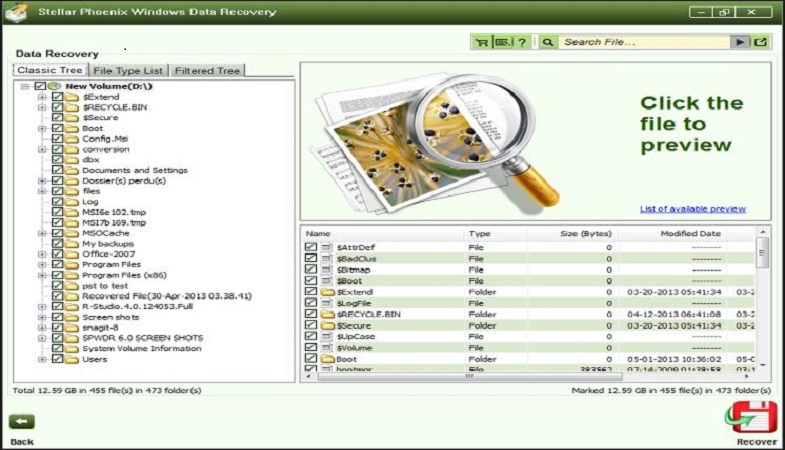 Some data recovery online tools are also available which can be used for the same purpose. In our opinion, there are five major components that make up a good data recovery program including security, quality, ease of use, compatibility and technical support. Any good data recovery software will be comprised of these components; hence you should make your decision after thoroughly checking the features of the data recovery software. 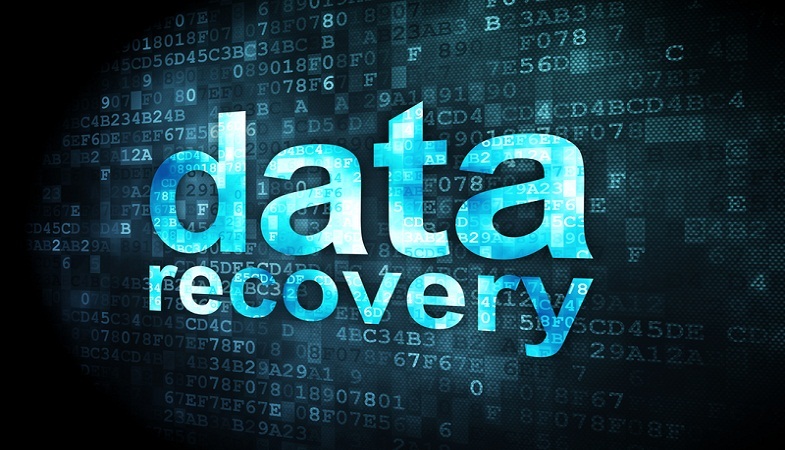 There are several top best data recovery software and tools available for free on the internet. Some of them have gained a good reputation in the market while others could not manage to impress. This post will summarize the top 5 best data recovery software that are available for free. Let’s have a look at them. EaseUS Data Recovery Wizard is one of our best picks for the data recovery software as it has been around for more than a decade. This is not just an ordinary data recovery software but also a user-friendly app having a Windows Explorer type interface. By following its three easy steps procedure, you can recover your data without any hassle. The three steps to recover data are as follows: first, you need to select the data type, then select the location and last but not the least preview and recover your data. Data up to 2GB can be recovered with the help of this software. It works efficiently on various drives including internal, external hard drives, USB flash drives, memory cards, and partitions supporting various file systems. 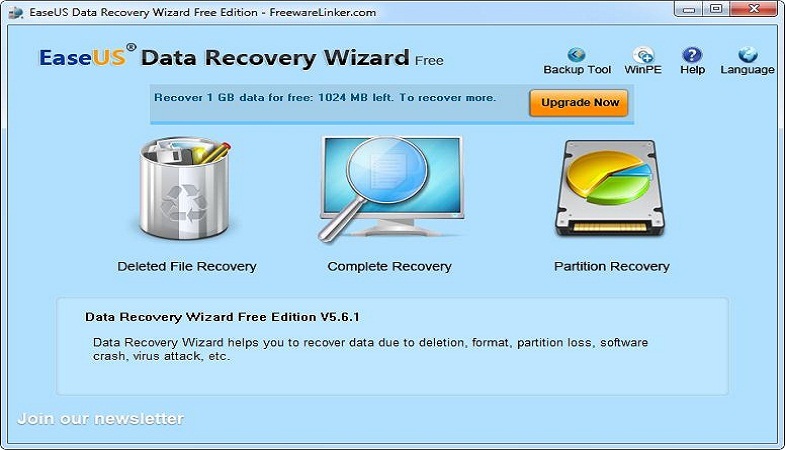 In short, EaseUS Data Recovery Wizard is best used for recovering casual data. If you wish to expand your recovery capacity, you can upgrade to gain full functionality of the program. Recuva, a data recovery software developed by Piriform, can help you recover permanently delete files which have been marked as free space by the operating system of your computer. This recovery software works pretty well on hard drives, memory cards, USB flash drives, MP3 players as well as other storage devices supported by NTFS and FAT file systems. It also has an app that comes in two versions – 32-bit and 64-bit. This software is available in both installable and portable form. The latter form helps you not risk the possibility of overwriting the hard drive, therefore it keeps you from losing data during the installation process. The data recovery software works as a Freemium, which means that its functionality can be increased by acquiring a commercial license. The app works as a Freemium, meaning that its functionality can be enhanced by acquiring a commercial license. All in all, Recuva is a good choice when it comes recovering the lost data. Our third pick for data recovery software would be Stellar Phoenix Windows Data Recovery. Offering excellent comprehensiveness and great technical support, this software can recover up to 500 file types (including Outlook emails) from any FAT, NTFS, and ExFAT based storage devices. The major benefit of using this data recovery software is that you can save and resume scanning image which helps you save time by not sitting in front of your PC and waiting for the scan to complete in case the partition is quite large (for e.g. a 1TB external drive). With Stellar Phoenix at your disposal, you can save the scan progress and carry on with your other tasks without having to wait for the scan to complete. As mentioned above, this software also offers incredible technical support via emails, knowledgeable articles, chats, and phone calls. Remo Recover Windows have been featured on our list because it’s nearly as powerful and dynamic as Stellar Phoenix. Its three standard modes – Recover Files, Recover Drives, and Recover Photos are listed on the main surface of the program. The reason why we recommend this data recovery software is that it works really well while recovering specific media files from your memory cards. Photographers and videographers can benefit from this software when they want to recover their deleted files from their digital cameras. Apart from offering data recovery service, Remo also provides useful information on tech specifications as well as video tutorials that can be found on their website. If you’re facing any trouble while using this program, you can always get in touch with their support team. 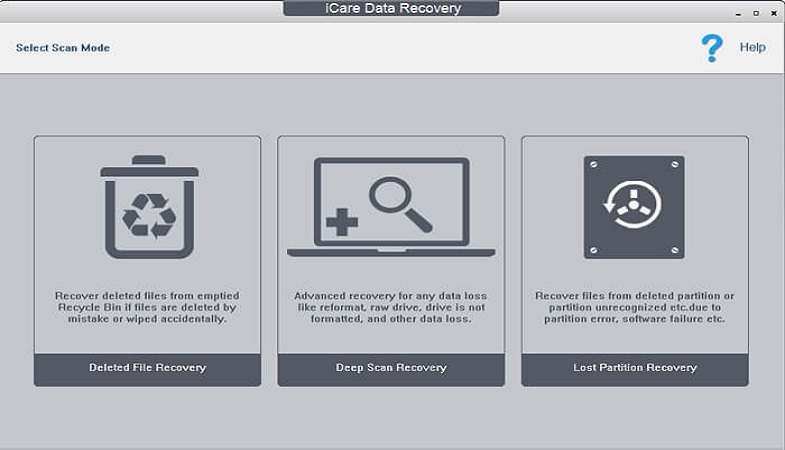 The reason for including iCare Data Recovery in this list is that its user-friendly interface makes the scan and recovery process hassle-free and convenient. Users will identify with this data recovery software as it is really simple to use. 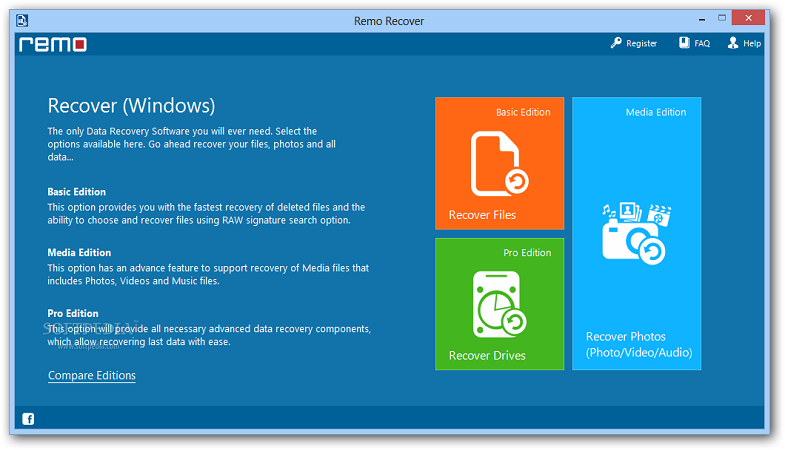 The three primary recovery modes of this software are evident and self-explanatory – Deleted File Recovery, Deep Scan Recovery, and Lost Partition Recovery. The only downside of this software which we came to face during the testing period was that it failed to retrieve the JPEG images for us. Though it’s not as powerful as its other competitors, we still believe it’s a fairly good program. It’s available for free and completely safe to use. Moreover, it works really well on your digital devices. If you’re looking for recovering your documents or rescuing them from hard drive failures, then we would recommend you pick this data recovery software.